We think country weddings can be elegant, classy, rustic, fun, intimate, chic and amazing! From a shabby chic wedding in a barn, to a beautiful tented reception in the countryside, we offer inspiration for your modern country wedding! I love this wedding photo shoot posted on Style Me Pretty, inspired by the trends, fabrics & themes showcased in Chanels Ready to Wear line. 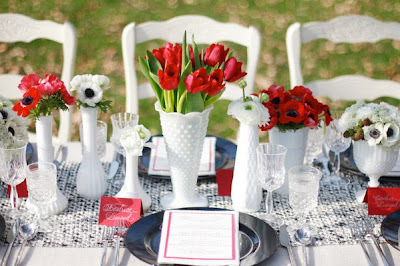 Such a great example of country glamour, and I love the mixture of milk glass vases! Check out the entire post for more fabulous photos. Want more rustic chic wedding inspiration? Check out our posts on the Stella Event Design blog--lots of beautiful country chic events, barn weddings, farm weddings and vintage inspiration! I love milk glass! And, with those red flowers? Gorgeous! Engagement party favors are often handed out to the guests as a thank you for attending, such as candy treats or custom beer koozies to take home as a memento. What's more, it incorporates "open air furniture" signage involved transport covers, seats and pretty much wherever else where individuals gather.